Is a float tube right for you? Anglers in search of boats or other “fishing platforms,” especially new anglers, often consider buying a float tube. A Cumberland Float Tube. Standard pontoon design. View more Float Tubes at Amazon. The reason many anglers consider buying one is because float tubes are lightweight, inexpensive and ultra-portable. For an angler on a budget and who needs a “floating platform” for fishing remote lakes or smaller bodies of water, float tubes can work well. Yet float tubes aren’t for everyone. Anglers often buy a float tube, use it twice, and then exile it to the garage once a float tubes limitations become obvious. So to help anglers better decide if a float tube is the right “floating platform” to use for their fishing needs, I’ve put together this article. Hopefully, this article will help anglers determine whether they should buy a float tube. And if so, what kind of float tube they should get. Is a Float Tube Right for You? Whether a float tube is the right boat for your fishing needs depends on one factor—where will you be fishing? Once an angler answers that question, deciding whether to buy a float tube is simple. River fishing and float tubes do not mix. This is especially true if the river has a current or, worse, rapids. On rivers that have strong currents or rapids, float tubes can be downright dangerous—especially when wearing waders. In short, if you’re looking to buy a boat for river fishing—a float tube is the wrong choice. For river fishing, pontoon boats, inflatable rafts, and inflatable kayaks are all excellent fishing platforms. 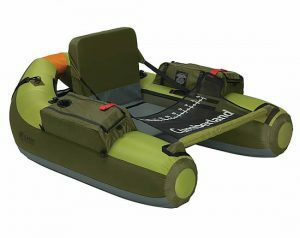 Float tubes are ideal for fishing in small ponds and isolated lakes in the backcountry. The problem is, on large lakes, pontoon boats and inflatable kayaks (which are much easier to paddle) are far superior fishing platforms. Float tubes are also dangerous to use on large lakes during windy conditions (not to mention exhausting to maneuver). Unlike pontoon boats, inflatable kayaks or inflatable rafts, float tubes are dangerous when waves are present. For fishing smaller lakes or along the shoreline on larger lakes (so you can get the heck off the lake quickly because of fatigue or high winds), then a float tube will work just fine. Fishing remote waters is the ideal use for a float tube. Float tubes are highly packable, far more than even packable pontoon boats. Of course, because most backcountry waters are cold, you’ll have to drag waders along to stay warm. The need for waders adds significant weight and bulk to the anglers backpack. By contrast, with a backpackable pontoon boat (or very small inflatable raft), waders aren’t needed. This leads to a choice—buy a backpackable pontoon boat or a float tube? If money and storage space aren’t an issue, get both. But if you can only have “one boat,” I’d suggest buying a small pontoon boat, inflatable kayak or inflatable raft. Float tubes simply lack the versatility that other boats provide. One of the problems with float tubes is that they lack the versatility of other inflatable boats. Float tubes are basically limited to small bodies of water with favorable weather conditions. And you can’t use them in rivers at all. The Sea Eagle PackFish. A great example of a true backpackable raft. The Packfish is a bit of a hybrid between a tiny raft and a small pontoon boat. Weighs 21 lbs. Of course, the reason anglers still use float tubes is because of their sheer portability. Even small backpackable pontoon boats still weigh more and are far bulkier to pack than float tubes. So this leads to a dilemma. Should then angler go for ultra-portability with limited versatility, or should the angler forsake some portability for versatility? Happily, Sea Eagle recently introduced a unique inflatable boat that neatly solves both problems. The Sea Eagle PackFish is a very small, lightweight portable raft specifically designed for fishing. With a weight of 21 pounds, float tube diehards likely will say “too heavy.” However, remember that to use a float tube the angler also needs to bring along fins, waders and other clothing to stay warm. And this “other gear and clothing” needed for float tube fishing weighs a lot and is far from compact. Anyone who has tried to stuff waders into a small pack knows how bulky and awkward they are. By contrast, with the PackFish all you need bring is the boat and your fishing gear. For this reason, the weight and bulk of the PackFish pretty much equal out to the weight and bulk of packing in a float tube with all the extra required gear. The PackFish has a weight capacity of 300 lbs, can be safely used on rivers with Class I and Class II rapids and inflates in just minutes. Floorboards are also optional for the PackFish. With the floorboards installed (which weigh about 10 pounds), the angler can stand fully erect in the boat with no danger of tipping (weather conditions permitting). As can be seen in these videos, the boat is easy to assemble and packs up into a small package and comes with its own backpack. The PackFish really is an ideal substitute for a float tube for anglers who seek to reach remote waters and have to carry the boat on their back. Moreover, the ability to use the PackFish on rivers that lack serious whitewater opens vast new fishing possibilities. The invention of pontoon style float tubes quickly supplanted round style float tubes. The pontoon style float tubes were popular due to easier maneuverability and had more features. I bring this history of float tube design up to stress that anglers should avoid buying any “round style” float tube. Although pontoon style float tubes are by far the most common, there’s still some round style float tubes available at various online and offline stores. But unless you enjoy tired legs and general exhaustion, there’s no reason to buy a round float tube. Indeed, if someone happens to give you a round float tube as a gift, I’d suggest asking if it was possible to take the cash instead. Yes….round style float tubes are just that bad when compared to the pontoon style float tubes. Check the Weight – Most float tubes are light enough to allow for easy transport. However, some of the newer, larger float tubes—while easily packable for a short, flat walk—are far from ideal for a long hike up a mountain trail. If you plan to venture deep into the backcountry with a float tube, remember that every ounce counts. Backpackable? 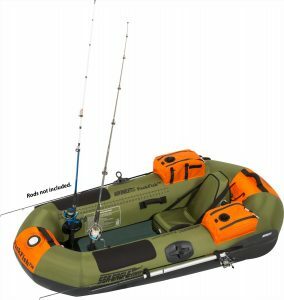 – If an angler plans to backpack to remote waters, the angler should always buy a “backpackable” float tube. Compared to a normal float tube, “backpackable float tubes” are easy to transport to remote waters. In particular, “backpackable” float tubes are lighter, less bulky and have design features (such as padded shoulder straps) that make it easier to backpack the tube into remote waters. Adjustable Backrest? – Any float tube an angler buys today should have a well-padded and adjustable backrest. The adjustable backrest makes a significant difference in how comfortable the float tube is during a long day of fly fishing. My suggestion is to avoid any float tube that lacks this important feature. How Many Pockets & Pocket Design – The number of pockets—and their design—is a personal preference. But before buying a float tube, anglers should note the number of pockets, how they’re designed and the pockets ease of access. While most fly shops sell one or two float tubes, finding a large selection of float tubes offline is often difficult. Even the large Cabela’s retail stores often only have “in-stock” a small fraction of float tubes available. Cabela’s – They probably have the largest selection of float tubes available. Amazon – They have a large selection of tubes available, too. Sea Eagle – Creators of the PackFish, which rivals float tubes in portability but offers far more versatility.